Memorial service for a ginkgo on Boleum Island held in 70 years. August. 20, 2018 07:35. by Won-Mo Yu onemore@donga.com. Celebrating July 7th in the lunar calendar on Friday, a day when two of the brightest stars, the Altair and the Vega, can see each other according to a Korean folk tale, a “memorial service for the ginkgo tree” was resumed by the Cultural Heritage Administration on Boleum Island, Ganghwa County, Incheon, after some 70 years. This ginkgo, registered as natural monument No. 304, carries the pain of national division as it is a male tree that used to make a couple with a female tree in a region now known as Honam-ri, Yonan County, South Hwanghae Province of North Korea. The 24-meter-high ginkgo with the girth of 9.8 meters was uprooted and swept away to Boleum Island by the flood some 800 years ago. Fishermen found the tree and planted it on the island, and memorial services for the two trees had been held in each region on the last day of the first month in the lunar calendar. With the division of the nation, however, the memorial services were also brought to a halt. Apparently located in a backyard of Honam Middle School in Yonan County, the female tree was designated as the natural monument No. 165 of North Korea. 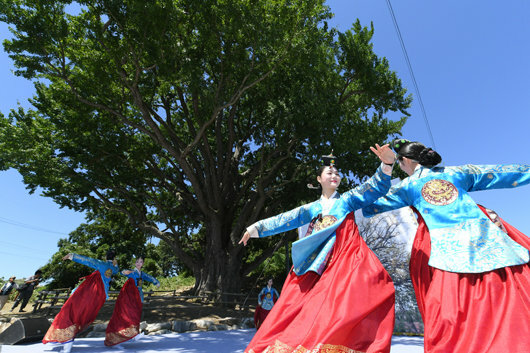 The event hosted by the Cultural Heritage Administration, Ganghwa County, and the Korea Cultural Heritage Foundation was accompanied by various performances including Korean traditional masked dances and ink-and-wash painting shows by painter Shin Eun-mi.